The Cesky Terrier is a loyal, happy, patient and yet feisty dog who loves his family and want to protect them. He makes a good watchdog because he is suspicious and reserved with strangers--but although he's slow to make friends, once he does he's playful and ready for games. He loves to fetch a ball or run outside, and he needs a regular walk. He has a strong prey-drive and will chase after small animals and kill them. He can get along well with other dogs, but probably not with small pets due to his high prey-drive. He is not an aggressive dog, he loves children and is excellent and patient with them as long as they are well-behaved. He should however be around different people while he is still young, so he can get used to making friends. He wants to be with his owner and loves his family, and doesn't like to be left alone. He's a moderately energetic dog who loves food and to eat--so you must be sure not to overfeed him, and also be sure he gets plenty of romps to keep his weight down. Occasionally he can be stubborn, but overall he's an obedient and trainable dog who is your dedicated companion. He virtually doesn't shed and so would be a good pet if you like to keep your home tidy. 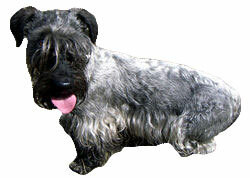 The Cesky Terrier is 10 to 13 inches tall (to shoulders) and weighs 16 to 22 pounds. He has a long, fine, slightly silky coat. When he is a puppy he is black, tan, or brown, but as an adult his coat turns gray and sometimes has white, black or brown in it. He only needs to be brushed occasionally. Pet coat: Clipped short every few months. Show coat: Scissored into shape every 6 weeks. The Cesky Terrier, also known as the Bohemian Terrier, is a relatively new breed, developed by a Czech geneticist named Frantisek Horak. In 1945 he crossed a Scottish Terrier with a Sealyham Terrier to produce the breed because he thought it would make a great hunting dog. The Cesky was at first well-known only in Czechoslovakia and Scandinavia. The Cesky Terrier is used in hunting rabbits, ducks, fox, and even wild boar! Now the Cesky Terrier is popular in England, America, Canada and Australia as well, and is recognized by many kennel clubs around the world.